Background: It has long been recognized that ensuring analyte stability is of crucial importance in the use of any quantitative bioanalytical method. As analyses are usually not performed directly after collection of the biological samples, but after these have been processed and stored, it is essential that analyte stability can be maintained at storage conditions to ensure that the obtained concentration results adequately reflect those directly after sampling. The conservation of urine samples in refrigerated/ frozen conditions is strongly recommended; but not always feasible. The aim of this study was to assess the stability of some well-known drugs of abuse methamphetamine (MA), 11-nor-9-carboxy-Δ9- tetrahydrocannabinol (THC-COOH), benzoylecgonine (BE), and morphine (MOR) in urine samples kept at room temperature by adding a salt mixture (sodium citrate, sodium ascorbate, borax). Methods: Two different urine samples were prepared with and without salt mixture, stored at room temperature and then analyzed by gas chromatography-mass spectrometry at 0, 1, 7, 15, and 30 days after collection/preparation to look for eventual analyte degradation. Results: Methamphetamine showed no significant changes with respect to the time of collection/ preparation (T0) up to 7 days later (T7), with or without salt mixture addiction. Then a significant degradation occurred in both salted and non salted urine. BE decrease was observed starting from day 1 after sample collection in salted and not salted samples, respectively. Salt addition seemed to reduce at least the initial BE degradation, with a significant difference (p<0.001) at 7 and 15 days of storage. However, the degradation was not more prevented in salted samples at 30 days of storage. A 20% decrease of MOR concentration was observed starting from day 1 after collection/preparation, both in salted and not salted samples with no subsequent decrease. With regard to THCCOOH, a significant decrease was observed starting from 7 days after collection/preparation, with of without adding the salt mixture. However, when comparing salted versus non salted samples at each time point, a statistically significant difference was observed at 7 and 30 days of storage. Conclusion: The results obtained indicate that the degradation of MA, THC-COOH and BE in urine samples kept at room temperature can be slowed by the addition of the salt mixture, whereas it seems to be ineffective in samples containing MOR. This evidence has to be taken into account, in the eventuality of using salted urine to prevent in a certain extent abuse of above-reported drugs of abuse. Keywords: Drugs of abuse, analyte stability, room temperature, Gas chromatography-mass spectrometry (GC-MS), urine sample, salt mixture. Keywords:Drugs of abuse, analyte stability, room temperature, Gas chromatography-mass spectrometry (GC-MS), urine sample, salt mixture. Abstract:Background: It has long been recognized that ensuring analyte stability is of crucial importance in the use of any quantitative bioanalytical method. As analyses are usually not performed directly after collection of the biological samples, but after these have been processed and stored, it is essential that analyte stability can be maintained at storage conditions to ensure that the obtained concentration results adequately reflect those directly after sampling. The conservation of urine samples in refrigerated/ frozen conditions is strongly recommended; but not always feasible. 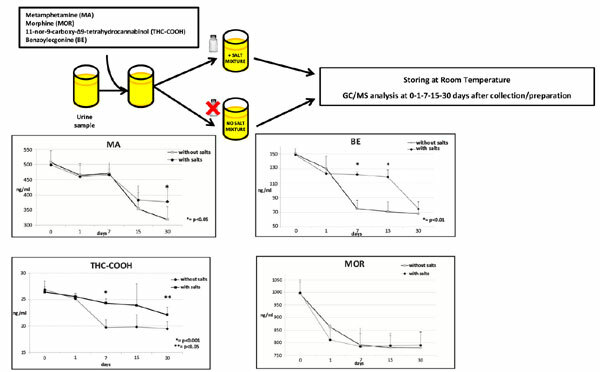 The aim of this study was to assess the stability of some well-known drugs of abuse methamphetamine (MA), 11-nor-9-carboxy-Δ9- tetrahydrocannabinol (THC-COOH), benzoylecgonine (BE), and morphine (MOR) in urine samples kept at room temperature by adding a salt mixture (sodium citrate, sodium ascorbate, borax).